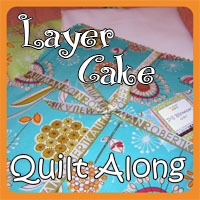 Spun Sugar Quilts: Layer Cake Quilt ALong and the Winners! Can't wait to share my block with all of you! Look for it on the 16th....at a blog near you. I would love a chance to win a copy. Congratulations on the block and the cover! How exciting for you! Annndddd, I would love a copy of that magazine...thanks for sharing. I have sent you both emails! Thanks for all the awesome comments about my block. I hope Quiltmaker will let me design in the future for them! Oh I can't wait to see your block next week! !